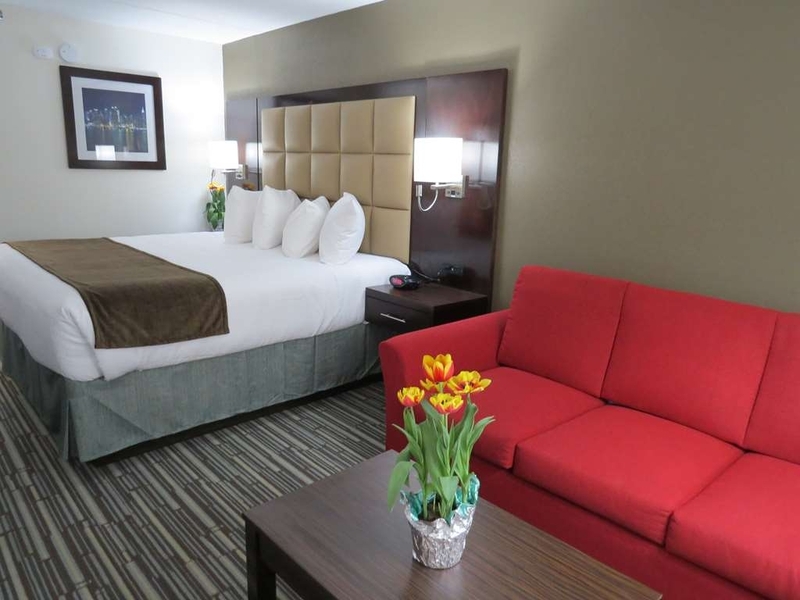 Das Best Western Plus East Syracuse Inn ist ideal in East Syracuse Stadtzentrum zu finden. Erleben Sie ein schöner Aufenthalt in der Nähe von alle Sehenswurdigkeiten. Bestpreisgarantie und exklusive Angebote. 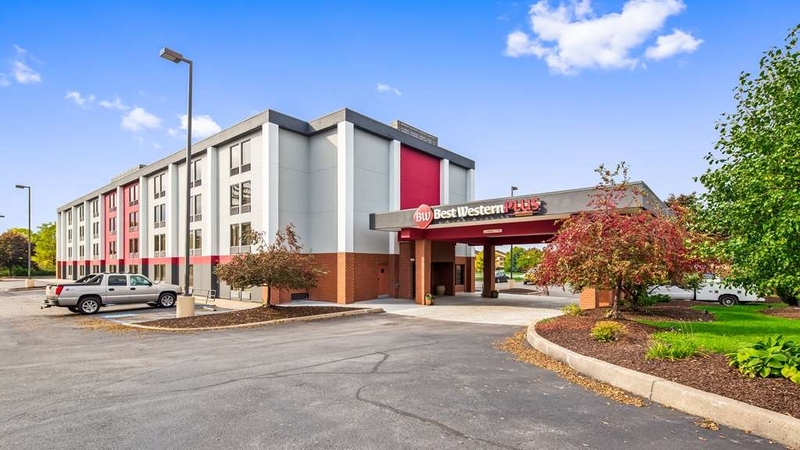 Im Best Western Plus East Syracuse Inn, günstig gelegen am NYS Thruway I-90, erwartet Sie ein luxuriöser Aufenthalt zu einem erschwinglichen Preis. Die Nähe zum Thruway ist nur einer der Lagevorteile des Best Western Plus East Syracuse Inn. Die I-81 und NY-481 sind nur 1,5 km entfernt und das Stadtzentrum, der internationale Flughafen Syracuse Hancock (SYR), die New York State Fairgrounds und der Luftwaffenstützpunkt Hancock sind in nur wenigen Minuten erreichbar. 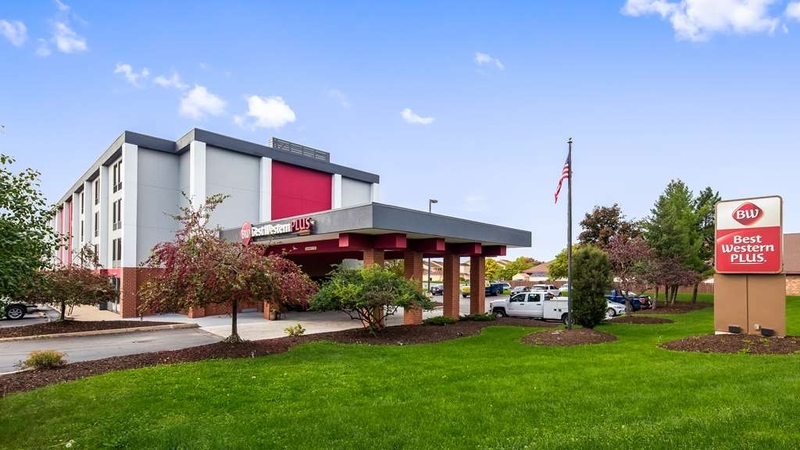 Das Best Western Plus East Syracuse Inn wird dank seiner hervorragenden Ausstattung Ihre Erwartungen an den Reisekomfort übertreffen. Das aufmerksame Personal verfolgt ein gemeinsames Ziel: Ihren Aufenthalt so angenehm und komfortabel wie möglich zu gestalten. Ein großer Arbeitsbereich, kostenloses drahtloses Internet (Wi-Fi) und bequem zugängliche USB-Anschlüsse und Steckdosen sorgen dafür, dass Sie Ihre Geräte in Ihrem kürzlich renovierten Gästezimmer jederzeit aufladen und immer in Verbindung bleiben können. Morgens erwartet Sie ein frisches, kostenloses warmes Frühstück mit Waffeln zum Selbstbacken, Eiern, Fleisch, Joghurt und mehr. Als unser Gast können Sie auch unseren Gemeinschaftsbereich mit einem großen Flachbildfernseher, Spielen und einer voll ausgestatteten Küche nutzen. Unser Business Center bietet einen vollständig eingerichteten Arbeitsplatz mit Computern, Drucker und weiterem Bürozubehör. Sie möchten eine Tagung ausrichten? Bei uns sind Sie gut aufgehoben. Unser Tagungsraum, ausgestattet mit einem Smart Board, eignet sich ideal für größere Gruppen. Für kleinere Konferenzen steht unser Konferenzraum zur Verfügung, der über eine große Präsentationsfläche verfügt. Zur weiteren Ausstattung gehören ein Fitnessstudio, eine rund um die Uhr verfügbare Kaffeestationund ein großer Parkplatz um die gesamte Anlage, perfekt für Busse und große Lastwagen. Darüber hinaus verfügt jede Etage über einen Eiswürfelbereiter und einen Verkaufsautomaten. Die Attraktionen von Syracuse sind nur wenige Minuten entfernt! Viele Restaurants liegen in Laufnähe, und viele weitere sind nur eine kurze Autofahrt entfernt. Besuchen Sie bei Ihrem Aufenthalt in der Stadt das Einkaufs- und Erlebniszentrum Destiny USA und das Turning Stone Casino, oder sehen Sie sich ein Spiel an der Universität von Syracuse an. Oder wie wäre es mit einem Konzert im Lakeview Amphitheatre, einem Besuch des War Memorial oder einer Show im Landmark Theatre? I'm so sorry to hear that you were disappointed in your stay with us and appreciate you taking the time to let us know about the issues you experienced. As you can tell from previous reviews, this is not typical of our hotel, and we will take your feedback and work diligently to correct all of our shortcomings!! We stayed here with our two year old overnight as a midpoint for a long interstate drive. We arrived late at night and while the check in staff member was very nice and overall look of the hotel was as expected, we were extremely concerned when we arrived in our hotel room (218) to discover a large crack in the big (second floor) window and the smoke detector hanging off the wall. My husband raised the issue with the front desk and we were moved to another room down the hall (222), unfortunately this room did not have an undamaged smoke detector either - the cover/front of the unit was missing and since we could not see a flashing light either, we were unsure if it was even functioning. Extremely concerned, we again complained and were moved to an accessible room (the hotel was apparently full and I requested we be placed on the first floor due to my safety concerns) which meant no sofa or coffee table, tv stand, etc, however at this point we did not care. Had it not been so late at night we would have simply left to find a new hotel after seeing the first two rooms, but thankfully this room at least did not have any obvious issues. The rooms overall did not live up to the photos of the website, but were adequate for an overnight, however these safety issues were extremely concerning and unacceptable, particularly for a hotel claiming the following on their website “completely remodeled in the spring of 2017, we guarantee an extraordinary experience”. I was also not impressed to see the staff member who checked us out in the morning standing in front of the entrance smoking as we got into our car - just very unprofessional and a bad look in my opinion. I have contacted the hotel chain with my safety concerns (as well as raising them at the hotel at the time) and I certainly hope they will be repairing these safety issues as quickly as possible. I have to say that the young woman at reception who dealt with these issues at the time was very apologetic and quick to find us new rooms, we appreciated her willingness to resolve the issues in a friendly and understanding manner. Please accept my heartfelt apologies for the issues you experienced during your stay with us. It is our goal to exceed the expectations of every guest who enters our hotel, and we have certainly fallen short of that you and your family. I appreciate you bringing your safety concerns to my attention so that we can get them corrected. I've just sent maintenance up to both of the rooms you mentioned to fix the smoke detectors immediately. Again, I truly apologize and I thank you for your feedback. It's only with feedback from our guests that we can know where we fall short and continue to improve. For the rate; it is a great hotel. Joie at the front desk is exceptional! We had 3 separate requests during our stay and she immediately responded and provided us with what we requested. We usually have good luck with Best Westerns and this was no exception! Thank you for taking the time to write a review about your stay. We really appreciate the feedback. I'll be sure to pass your comments on to Joi!! Hope to see you again soon! "GREAT VACATION PLACE TO STAY"
Thank you for taking the time to review your recent stay with us! I'm thrilled to hear that you enjoyed everything and I will be sure to pass your compliments on to Thomas as well! We hope to see you again on your next trip to Syracuse! "Updated floors, still working on the rest." Took my son for a University Showcase so he needed to be well rested for the next day. I didn't have high expectations but this one still didn't meet them. When I booked I asked for a quiet spot in the hotel and extra pillows. We had the pillows and were put at the far end of the hotel. When we entered our room our shoes stuck to the floor. We bottle necked there because the furniture is too big for the room with closet was in the middle of the room, not by the door. Water damage and mold on the ceiling in the bathroom around the sprinkler, hole in the back of the bathroom door made me feel like this hotel wasn't so refreshed. The heater was set to 70 but it was HOT in our room, we just shut off the heater on a very cold night which comfortable, not cold. 1 of 3 of us found the beds comfortable. At about 2am there was someone pounding on a door a few over from us. Once the door was answered they started yelling and screaming at each other. This went on for a bit. The ice machine on the 2nd floor was broken which just seem to add to the disappointed mood. The following morning breakfast was at the lower end of the typical free hotel breakfasts as the foods were very processed and stiff. The counters were dirty and the lids on the hot food had been broken more then once but were held together with tape. My son complained that his cranberry drink smelled like tomato juice. I wouldn't recommend this one, there are a lot of different hotels to choose from in this part of the city. Please accept my sincerest apologies for the issues you experienced during your stay with us. I appreciate you bringing your concerns to my attention so that my team and I can work to correct the things we can control for the future. Arrived at hotel at 3 am after a long trip. I was greeted by Tom, who did the fastest check in. Went out to park the car, upon reentering I tripped and fell. Tom was right there. I assured him the only thing hurt was my pride. We went on u[p to our. With moments a knock came to the door and Tom was there checking to make sure I was okay, if I need ice or anything. Great customer service, that is rare in today's world. The room was very comfortable and clean. I truly appreciate you taking the time to review your stay with us!! Thank you for letting me know that Thomas took good care of you- he is definitely an asset to our team and we are lucky to have him. I'll be sure to pass your compliments ton to him and I hope to see you again soon! Second year in a row the TV service was not good-poor reception. Owners must take care of this problem. Ran out of breakfast items one day. Staff working their are always pleasant. Might consider staying there again if TV issues are resolved. I really appreciate you taking the time to let us know about your stay. I will definitely take your feedback and look into the TV issues- we thought we had corrected that problem and I'm very sorry that it wasn't fixed in your room. I hope you'll give us another chance! The beds were very comfortable. The room was clean. Nice decor. The bathroom was clean. The breakfast was good. The hotel didn't have an old smell like some. Overall really good experience. We will be back! I really appreciate you taking the time to review your stay with us, and I'm thrilled to hear that you enjoyed it. I look forward to seeing you again on your next trip to Syracuse! I really appreciate you taking the time to review our hotel! I'm thrilled to hear you enjoyed your stay with us and hope to see you again on your next trip to the area! 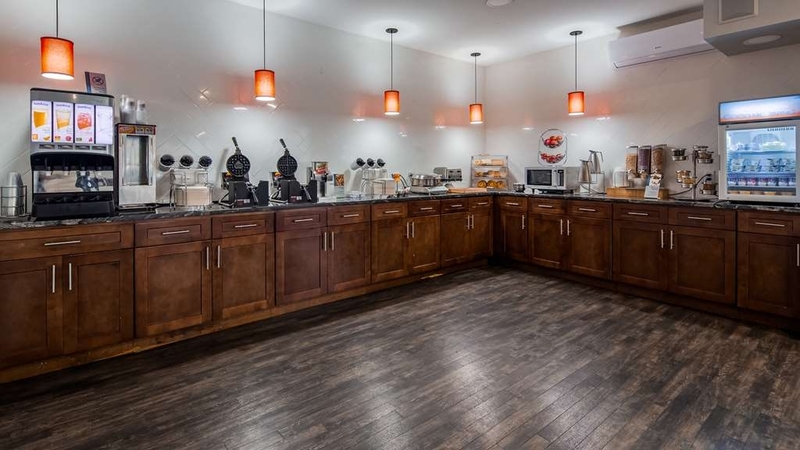 Close to shopping amenities; good hot breakfast; quiet residence for early sleepers. Pillows are hard - not good for stomach sleepers. Rooms are clean and all that is needed for a good nights sleep after attending a concert and /or day's shopping. Thank you for taking the time to review our hotel. I'm thrilled to hear that you enjoyed your stay and hope that we will see you again in the future! This is the 2nd time in the last 3 months we have stayed at a BWP and I can tell you from now on we will look for them first. Rooms are nice, beds are comfortable and the staff is always awesome. We came to this hotel in a bad mood because we were moving from another local hotel and we were not impressed. The front desk staff was amazing, entertaining and fun. By the time we went upstairs we were smiling. Bed was super comfy, room was very clean and we were immensely impressed with the experience! Thank you so much for taking the time to review our hotel! I'm thrilled to hear that we were able to turn your night around and give you a great experience. I've passed your compliments on to the team, and they appreciate your kind words as well. I hope to see you again the next time you're in Syracuse!! We were passing through on an extended weekend to New England. 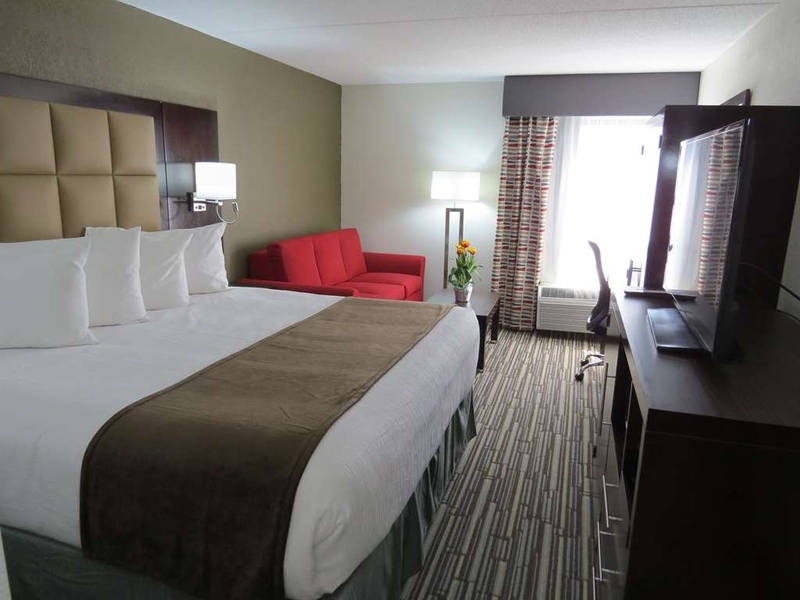 We usually stay at a Hilton property (Hampton, Garden Inn or Homewood) but decided to try this place out because of the very low rate as compared to other hotels in the area. The room turned out to be recently updated, very quiet, clean and comfortable. On par with much more expensive Hilton properties. 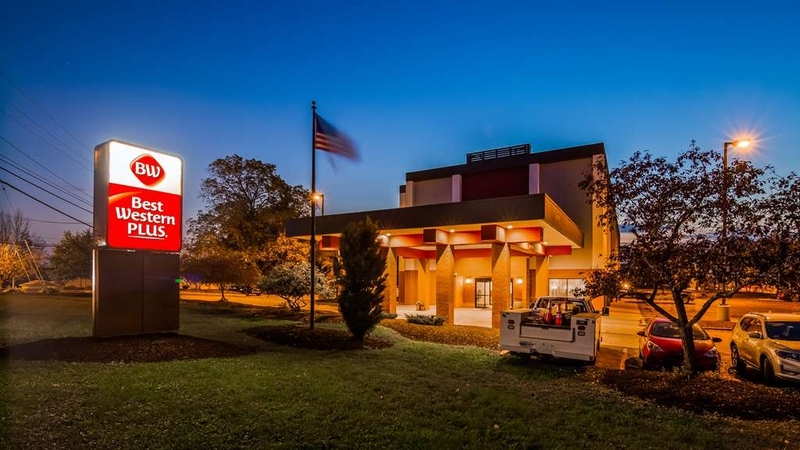 The hotel is located close to the interstate but far enough that you can't hear traffic noise and with a bonus of lots of restaurants within walking distance. We were not impressed with the breakfast - not a lot there and what there was looked sad, even worse than Hampton's mediocre breakfasts. But if you're a waffle lover, people around us seemed to enjoy making their own. But given the reasonable price of the room, we could easily buy a better breakfast on the road if we had to and still have money left over. 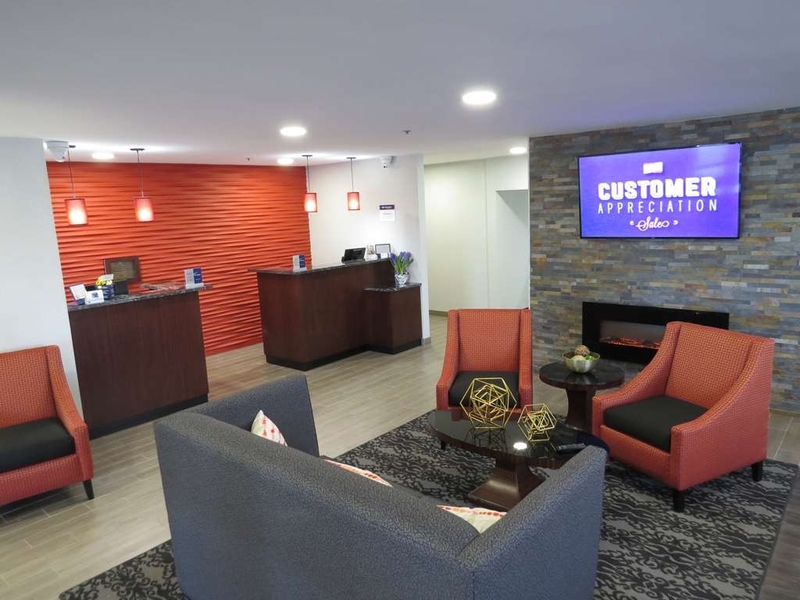 The only other hiccup was the inability of the front desk staff, both upon check-in and check-out to apply a Best Western gift card against the room charges. Not a big deal - called the BW customer service 1-800 number and they straightened it out. All in all, We would return for the very quiet and comfortable room at a very reasonable price. I really appreciate you taking the time to write a review of your stay with us. Please let me apologize for the confusion surrounding the use of your travel card, I've spoken with the front desk team members to make sure they're aware of the process for the future! We have begun changing up our breakfast options to get some new variety in and make it a better breakfast, and I appreciate your honest feedback on it. It's only with feedback from our guests that we can continue to improve. I hope to see you again soon! I wanted to write a review because I read some very negative reviews on here and really wanted to put in my experience. I stayed with my husband and 4 year old son this weekend, and we really enjoyed the hotel. The staff was super friendly; the desk women (especially Joi) AND all of the cleaning ladies always greeted us pleasantly when walking by. They made conversation with my son and didn't mind that he is a bit hyper lol. The breakfast was completely satisfying, the room was clean and updated, parking was easy, the internet did not give us any problems, and it was SUPER cheap to stay here. We booked through Groupon instead Of travelocity and saved $100! We would definitely stay here again. Thank you for taking the time to write a review of your stay with us! I'm thrilled to hear that you and your family enjoyed it, and I will be sure to pass your compliments on to the team- they always appreciate hearing our guest's kind words. I hope to see you again on your next trip to the area! "WARNING Your credit card is not safe with this hotel"
We booked a block of rooms for a group trip. Each room paid separately upon leaving the hotel after our stay... then 2 months later I got a $2100 charge on my credit card. While they reversed the charge after I called to complain all they had to say was sorry... WILL NEVER STAY AT A BEST WESTERN AGAIN AND IF I WERE YOU I WOULDN'T EITHER. Please allow me to apologize again for this issue. As we've discussed a few times it was a serious error on our part and a glitch in our system in determining who was to pay for the rooms, as your credit card was on file for the entire group per your contract. It has never happened before and will not happen again in the future. I truly cannot say sorry enough that it happened to you. When we talked the first time we let you know that we immediately refunded the money and would be happy to also refund any additional fees associated with the transaction- and we did in fact do that. If there's anything more that we can do for you, please feel free to reach out and I'd be more than happy to discuss with you. One of the worst hotels we have ever stayed in. Got in the fist night - front desk staff didn't want to be bothered. When asked about local restaurants they pretty much said they didn't know of any. We asked about the place next door and all they said was it was expensive. Ended up finding several really good, reasonably priced places on our own. There were 4 of us but only three towels in the room, broken coffee maker in both rooms we had, no working ice machines in the ENTIRE hotel - just bags of ice at the front desk, phone not connected, and the rooms cards would not work at all! Had to keep going down to the front desk for everything because we couldn't call them. We couldn't get wifi and when I went to the desk they handed me a piece of paper with a phone number and told me I would have to call myself, so I spent 20 minutes on the phone trying to get internet as I needed it for work. They moved us the second night to another room and that one was dirty and had a lot of problems as well. Entire hotel was dirty and smelled in areas. In the morning I could hear the conversation in the next room over. There was a nice young girl that worked there who was the only one who was really helpful and ended up crediting the entire first night and then another 50 bucks off. If it wasn't for that I would have lost it. I would never stay in that hotel again or recommend it to anyone. A few people I met while working at the state fair asked where we were staying and when I told them they said "ugh - how bad is it? ", so they obviously have a bad reputation locally. Just terrible. I'm so sorry to hear that you had a bad experience during your stay with us, and I appreciate you bringing your concerns to my attention so that I can correct them for the future. I'll be sure to talk to my desk staff about helping our guests find good places to eat as there are so many locally that we should recommend! We actually have many long term fair vendor contracts who have been with us for years and years so I'm surprised to hear that your perception is that we have a bad reputation- especially with those vendors. Again, thank you for letting me know about that so that I can correct it. I'm happy to tell you that we have a team on property this week upgrading our entire wifi system- it's something we wish we were able to get done sooner, but unfortunately we were not able to do so. Also, the new ice machines arrived and will be installed this week. I realize you that doesn't in any way make up for the issues you experienced, and I truly apologize that you had such a bad stay. I know you have many options when traveling and hope you'll give us a second chance in the future. Nice and clean. Good room with standard amity. Good breakfast time should be extend on weekends. One thing to note is our map app sent us past the hotel. Parking was easy. Check in and out quick and easy. I really appreciate you taking the time to let me know about your stay here! I'm glad to hear that you enjoyed your stay, and will definitely consider your feedback about extending breakfast hours on the weekend- especially those busy weekends like the one when you were here. I hope to see you again on your next trip to Syracuse! It used to be a family tradition to go camping at least once a Summer. But as another hot one comes to a close, the idea of sleeping in a sweaty tent sounds more like a punishment than a getaway. So we traded the bugs and long walks to the public restrooms for a cozy cloud bed and personal remote. 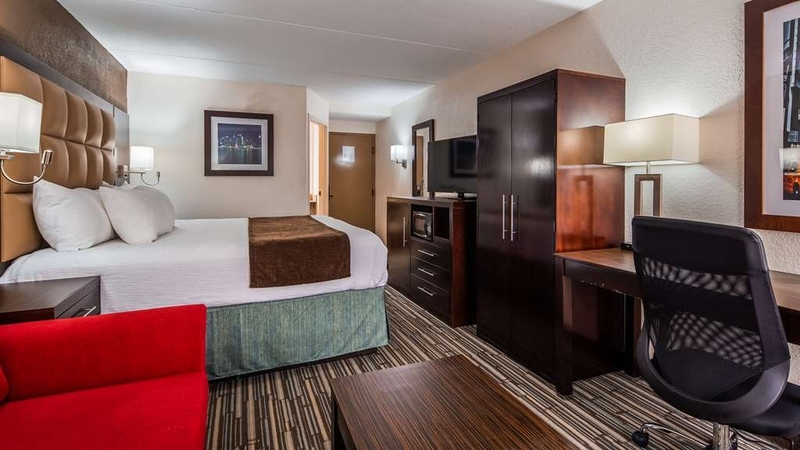 If you find yourself in East Syracuse, NY in search a clean and comfortable room, look no further than the Best Western Plus of East Syracuse. The breakfast buffet was delicious and had choices for all tastes. Premium toiletries are the silent extras you'll find here. I say the Plus must be for the A+ way I felt for staying here. Thank you, Best Western Plus of East Syracuse, NY. Thank you so much for your review!! It was completely our pleasure to have you as our guest and I'm thrilled to hear that you enjoyed your stay with us. I hope to see you again if you decide to ditch the tents again next year! The hotel is close to where I wanted to be and was a good price. There are stains on the bedroom furniture and the ac makes a few extra noises. The gym didn't have towels and the clock didn't work. It was well appointed though good equipment. It was generally ok likely wouldn't go back. Thank you for taking the time to write a review of our hotel. I'm sorry to hear about the issues you experienced, but appreciate you bringing them to my attention. It is only with feedback from our guests that we can continue to improve. I will take your feedback and make some changes with my team to ensure that we correct the problems for the future! 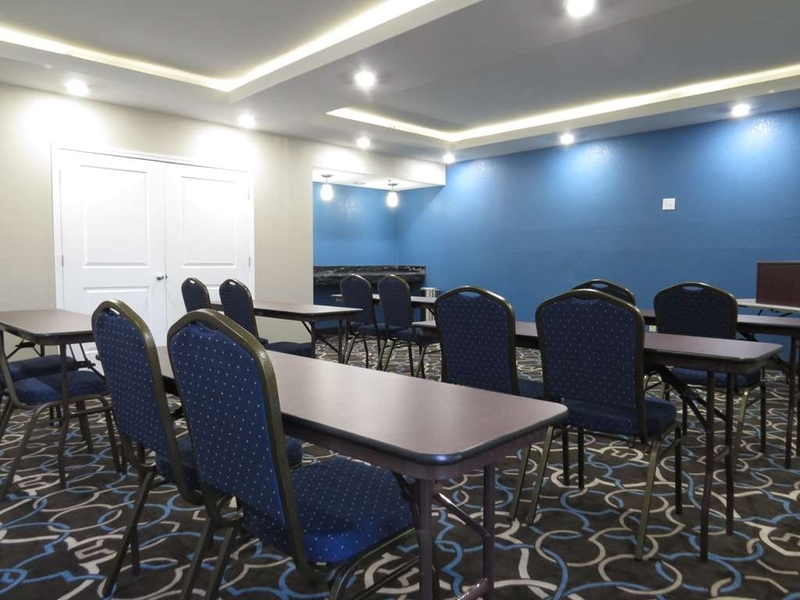 This hotel has been renovated and offers a clean comfortable night's stay. Staff was very pleasant and efficient. It was a great value and very pleasant. Haven't stayed at a BW in years but will add it to the list in the future. Thank you so much for taking the time to review our hotel! I'm thrilled to hear that you enjoyed your stay with us, and that you will add Best Westerns to the list in the future. Hope to see you again next time you're in Syracuse! We were just needed a room for the night and we were very happy with our room. It was a large room with independent air conditioning you could control the temperature. It was a clean room. The bed and pillows were very comfortable. The shower pressure good. We had a couch and desk area. Great breakfast. I would recommend. Thank you for taking the time to review our hotel. I'm so happy that you enjoyed your stay and look forward to seeing you again on your next trip to the area! Please accept my apologies again for the issues you experienced at our hotel! I'm happy to hear that my team took care of you to your satisfaction, and really appreciate you bringing to to my attention so that I can look into what happened! I hope to see you again on your next trip to Syracuse. "Three False alarm ruined the night"
We stayed the hotel one night on 1st August en route to NYC. Checked in around 11pm and rushed to bed after ling driving. But awoke by a loud alarm noise around 2am? My husband checked the hall way, nobody around but few opened their doors looking also and then decided urged us outsides. About a dozen people scattered in front entrance. A hotel staff explained that the alarm system showed hazard in building and he called 911 accordingly. Five minutes later a scouter truck came check first. Then a fire truck following. Several firr fighters ran through building on site exam. After 20 minutes we are noticed all clean and craw back to room trying to catch back sleep. Around 5am?, alarm arouse again. Oh my God! Cannot sleep any more. In morning dinning room, we had our breakfast exaustly, the alarm sang loudly, again. What a night! And we were happy while we hit the road. Finally no more alarm noise. Beside the alarm issue, the hotel decoration is worn and dated. It needs renovation, especially the carpet. Beds are firm and comfortable. Thank you for taking the time to review our hotel. I'm so sorry that you had to deal with the issues we had with out alarm system that evening!! I truly can't apologize enough for the lack of sleep you, and all of our guests, endured that night. The issue was a short in the wire that was resolved by mid- morning. I wish we could have avoided it or corrected it soon as to not disturb our guests. Again I certainly apologize, and appreciate you reaching out. "Lovely stay ruined by offensive media "
We just stayed last night. This morning, our breakfast was ruined by having to explain to our son, the racism/white nationalism on display. While we tried to enjoy our breakfast amid a wonderfully multicultural group of guests, we were all deeply offended and embarrassed by the display of Fox & Friends on the television. So very disappointed. I've never given such a bad review in my life, but I've never been this offended. I appreciate you taking the time to let me know about your stay and I'd like to apologize for the way you felt during breakfast at our hotel. Our lobby television default channels during breakfast hours are ABC or CBS unless a guest requests a specific channel otherwise. On the morning that you and your family had breakfast with us, we had a guest who asked my staff to turn the television to Fox while he enjoyed his breakfast. Our hotel does not take a political stance one way or another, we simply do our best to accommodate all guest requests. If my team had known how deeply offended you were by what was on the television, we would've changed the channel for you as well. We want all of our guests to feel comfortable when they stay with us and I wish we had known so that we could've put on something you'd have felt more comfortable with. If you'd like to further discuss, please feel free to reach out to me directly at the hotel. 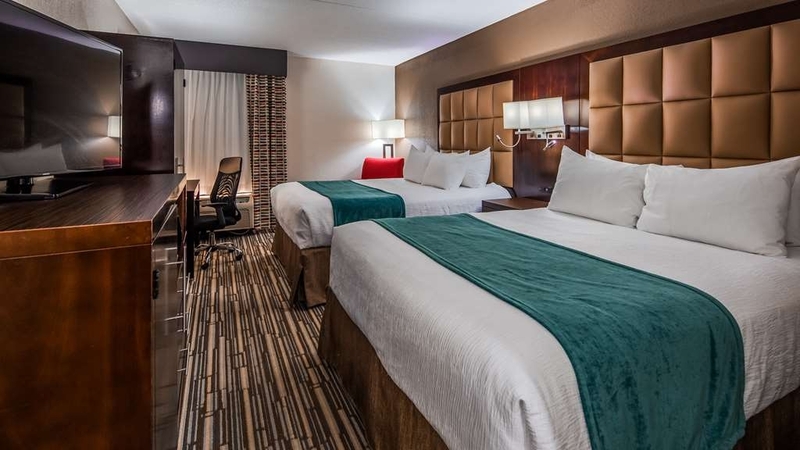 "Weird Smell, but newly remodeled rooms..."
I appreciate you taking the time to review your stay with us and thank you for your feedback on what we can do better to improve for the future! I've passed your compliments on to my front desk team and they appreciate your kind words as well. I hope to see you again soon! I stayed here for 2 nights in July to attend a concert at the Syracuse Amphitheatre about 20 minutes from the hotel. I was pleasantly surprised. The room had been renovated and was very nice. The breakfast was fine. I asked for an extra blanket as I was unloading my car and the front desk staff got it right away and I took it up on my cart. The A/C worked great which was a relief since it was in the 90s. The room was very quiet. I would stay here again. I called down to get an extra pillow and blanket before going to sleep and the front desk clerk told me I had to come down and get it myself. I work in a Best Western and we always deliver what the guest needs. If I cannot do it that second, I tell the guest an approximate time. If I am the only one at the front desk, I put up my sign that says I will be right back and I deliver what the guest needs. Very poor customer service.The microwave was quite dirty inside and the freezer looked like it hadn't been defrosted in months. There were also only 2 towels in the bathroom...for 3 guests. When I did my review that the hotel sent, I did not even get a response. We respond to all of our reviews. I will never stay here again or recommend it to anyone. "Best rest stop on route to canada"
This hotel was conveniently located midway on our trip to canada . The hotel serves its purpose . 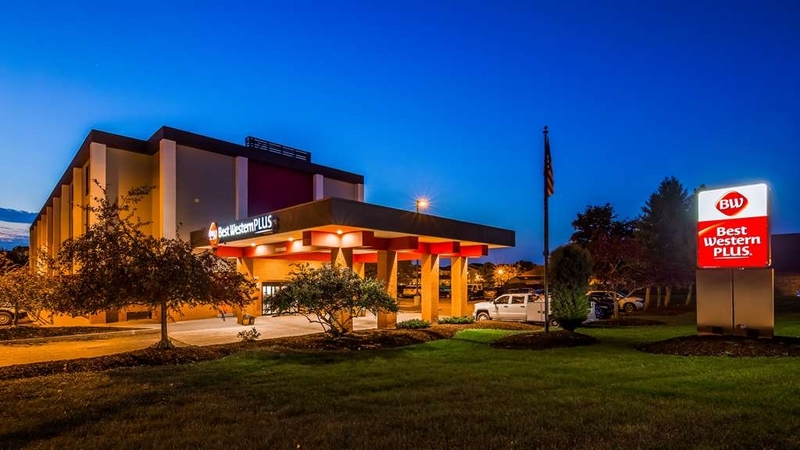 The sleep was comfortable and peaceful, the staff helpful and walking distance to ruby Tuesday. The neighborhood was all hotels around with a safe feeling around . The morning breakfast was pretty good with above average assortments of bagels and breads and pastries . We would stay here again.One note was that there was no pool. We stayed here based on the generally positive reputation of Best Western Hotels. Our first and last impression was the lingering smell of disinfectant - in the lobby, on the bed sheets - a sign that the facility is in serious need of refreshing. We know we can get better value for the money elsewhere if we book early. I am a Best Western Gold Rewards member. When checking in a lady who look like just came off of the street never smile and didn't say Welcome Best Western Good Member and just a straight face. Not even dress properly. The room was nicely updated. The next morning my wife was going to take a shower and I heard a big bang, it was the bathtub faucet that blew out of the wall. So no shower for either of us. At the same time I was making coffee and it look like tea so it went down the drain. I told my wife lets get out of here. When I turn in my room key a lady just sat there without smiley or say good morning. I told her about the shower problem and she didn't say any thing or even apologize for our inconvenience. We didn't bother to have breakfast there so we ate at the near by McDonalds. Pre-booked/prepaid our stay here, chosen because of location to major highway. Checked in after 3 p.m., very friendly and informative. Location seems to be trying to upgrade, and is appreciated. Room/king bed was great, restaurants nearby for good dining. Would consider another stay. Please accept my heartfelt apologies for the issues you experienced during your stay with us. We are in the process of updating our WiFi access points throughout the building to provide a better internet experience for our guests no matter where you are in the building. I truly appreciate you bringing your concerns to my attention as it's only with feedback from our guests that we can know where we fall short and continue to improve. I've also had a discussion with my front desk team because it's unacceptable for them to act as though they don't care. I do hope that you'll give us another chance in the future. Thank you for taking the time to review our hotel! I'm thrilled to hear that you enjoyed your stay and I've passed your kind words on to my team. I hope to see you again soon! I liked the room they were clean and comfortable had a nice 40 inch flat screen TV with lots of choices, refrigerator, microwave closet and nice beds. The room was great, however.... There were some issues that I was a little uncomfortable with. First of all our room was located outside of the maintenance or hotel staff room. This was a noisy area with staff talking loudly in the evening outside our door. There was pieces of steel bars sticking up out of the parking lot that someone could trip over and get hurt. When were coming back to the hotel in the late afternoon there was a couple of redneck looking barefoot dudes smoking out in front of the hotel with a case of beer. not a pleasant site, the hotel choose to ignore this ? Breakfast was your typical hotel breakfast waffles, cereal, juice etc.. I did like the free 24 hour coffee machine. Thank you for taking the time to review our hotel! I truly appreciate you bringing your concerns to my attention so that I can correct them for the future. I truly apologize for the issues you experienced and I hope that you'll give us another chance next time you're in the area. "Ok for price and convenience"
Beds are good. Breakfast ok and typical for this type of hotel. Location was good. Check in was a bit crazy but the computers were not working well. But, the person at desk did fine. She did not rush us even though there was a bit of a line. "Pathetic rooms caused asthamatic attack"
We checked in to east Syracuse Best western on 2nd september abd checked out on 3rd September. On checking out a polite front desk staff asked us bout the stay and she was informed that i had an asthma attack due to dust and dirt in the room and no one was available to help us. On getting informed she was so polite to give us a complimentary stay free night at any of BW. To our shock when we wanted to use those points now in Naperville BW for a stay they answered they are not reflecting, and we have misplaced our letter. After several calls, we were told to write to Aubrey who is the GM I guessbut to no avail.... This is so inconvenient for a BW member. My confirmation number for the stay was 631625699 Was booked in Praveen Dixit's name and we were charged a whopping USD 138.20 for a single shabby scary night. "Best Western Plus East Syracuse"
Check in was a little late (4pm) due to maid issues. Room was clean and had a huge television with all channels accessible. The bed was a little hard for my taste and the bathtub tap dripped all night. Breakfast was decent. This hotel located in Carrier Circle is the best in the entire area. 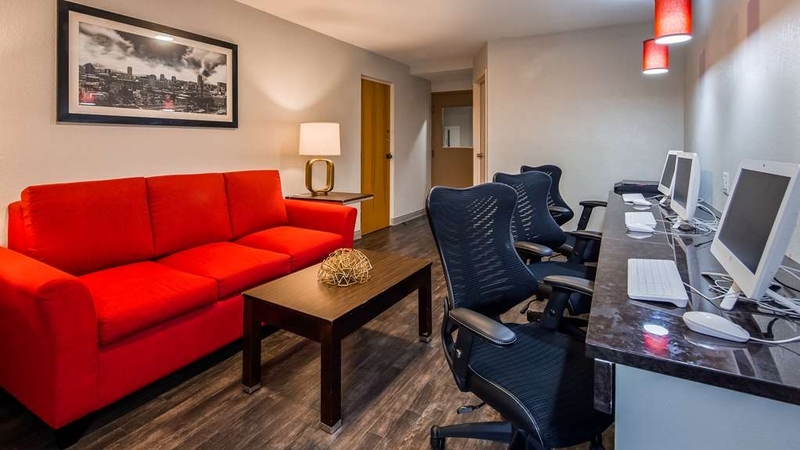 Updated, modern, immacate, priced for travelers, and well staffed by A+ employees. The lobby is warm and welcoming, with a big screen TV playing movies and the news. Thomas and Dwayne welcome you with smiles, politeness and are there to help you with great places to eat and visit. They make sure you are happy at all times. The free coffee is high-end and there is always fruit in the bowls for you. The rooms are BRAND NEW, well furnished, super clean, modern and the bed is AWESOME. Bright and clean bathrooms and showers. I've stayed here three times now and this place rocks. Wow- thank you so much for the AWESOME review! I am thrilled to hear that you've enjoyed your recent stays with us, and truly appreciate the feedback. I've passed your compliments on to the team and they thank you for the kind words as well. We strive to exceed the expectations of every guest who enters our hotel, and provide them with clean, comfortable accommodations and exceptional service. I'm glad you've received just that. I look forward to seeing you again next time you're in the area!! Good location (close to thruway), Ruby Tuesday, dennys and a couple other restaurants right there. Easy parking, friendly staff, quiet room, heater worked well, comfortable bed and room was clean. Breakfast included eggs, sausage, waffles, yogurt, muffins etc...I would definitely stay here again. Thank you for taking the time to review our hotel! I'm thrilled to hear that you enjoyed your stay and hope to see you again in the future. 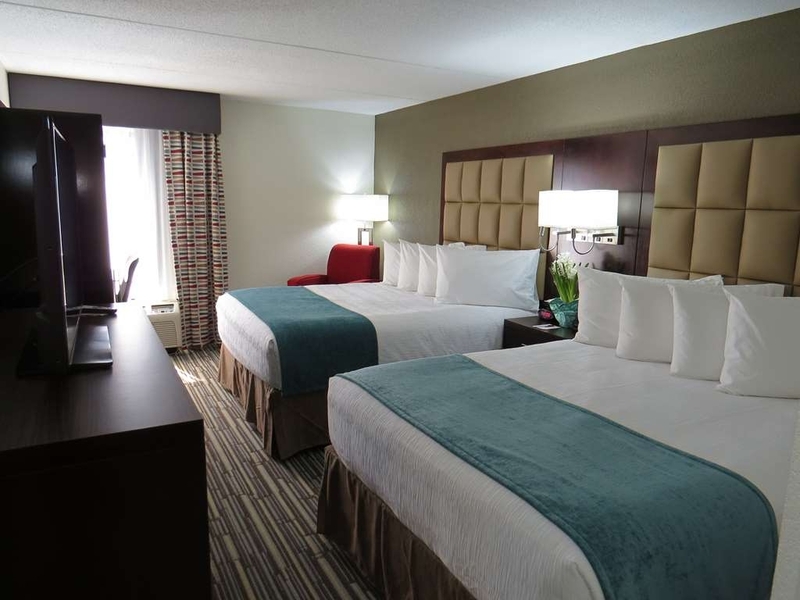 "Clean, Updated rooms and wonderful breakfast buffet"
Staff was very helpful. 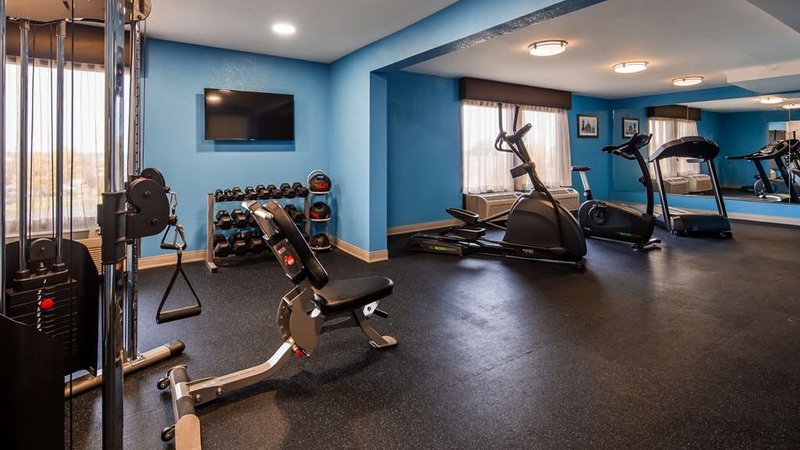 I enjoyed a workout in the fitness room and the free breakfast buffet before departing. I would recommend this Best Western to anyone visiting the East Syracuse/Carrier Circle area. Thank you for taking the time to review our hotel! I'm thrilled to hear that you enjoyed your stay and I look forward to seeing you again on your next trip to Syracuse. I love Best Western in general! This was my first time staying in this hotel in this area. The hotel is up to date compared to the ones that I've stayed in. It's very modern and comfortable to meet all of your needs. The staff is friendly! I really appreciate you taking the time to review our hotel. I've passed your kind words on to the team and they thank you as well. I hope to see you again on your next trip to Syracuse! Thank you for taking the time to review our hotel! I'm thrilled to hear that you enjoyed your stay. You can't beat those employee rates for sure, but I'm happy you took a chance on us, and hope to see you again in the future! I was very disappointed that I was advised by 2 different customer service reps, plus it is written on your site there are accommodations (I.e. crib or play park) for a baby when in reality there is none. Furthermore, there was no Wi-Fi connection in our room thus, the tv did not work. We were given another room which had the same problem. Thankfully Thomas found a room where it worked and had us moved there. Which was appreciated. Also, the heating system in the room made noise all night long. Please accept my apologies for the issues you experienced during your stay with us. We did have some issues with our TV service when you were here, and I'm really very sorry that you had to deal with it. The issue has been corrected, but I understand how frustrating it must have been for you to have to deal with. I sent you an email recently regarding your stay. If you could let me know where you saw those amenities (crib, play park, etc) I would greatly appreciate it so that I can have it removed as we do not offer those amenities. Again, I apologize. It's our goal to exceed the expectations of all of our guests and I'm sorry that we fell short of that with you. My husband and I had a very pleasant stay. Thomas at the Front Desk was outstanding. He made us feel welcome throughout our stay. The hotel is located on a quiet street. The room was comfortable, although the bed is too high, it was not easy to get on and off. The bathroom is small, making it difficult to open the door if you are standing in front of the sink and the space between the toilet and the bathtub is narrow. Thank you for taking the time to review our hotel! I'm happy to hear that you enjoyed your experience here. I've passed your compliments on to Thomas and he appreciates your kind words as well. I hope to see you again next time you're in town. My lovely wife and I spent 4 days over Thanksgiving here. The front desk clerk, Thomas, was outstanding. The way he treated us I thought he was the manager. The hotel was completely remodeled a few months earlier. A few bugs still to work out-most of the TV'S had poor reception and I assume it was because of the service provider or connection issues. The other issue was the tubs appeared to be recently reglazed and because of that the plunger did not hold water if you wanted to take a bath. Otherwise the room was very nice with a frig and microwave. The bed was very comfortable-but a tad high. Breakfast area was also remodeled and the food selection was nice. I would rate this an excellent choice once the TV and bathtub issues are resolved. Thank you again for the review! I truly appreciate it and look forward to seeing you next time you're in town! Our desk clerk, Thomas, greeted us and he was outstanding all week. The hotel was above average. Two issues that affected many guest was the TV going out and the plunger in bath not working. rest of the room was outstanding and the breakfast area nice and breakfast nice. Might be nice to consider later breakfats hours on a holiday weekend. Thank you so much for taking the time to review our hotel! I'm thrilled to hear that you enjoyed your stay with us. I appreciate you bringing your concerns to my attention- we have someone in today looking at the TVs and I'm confident we will find a solution. I will definitely take your suggestion about breakfast into consideration- that's a great idea!! I'll be sure to pass your kind words on to Thomas- he's a key player on the team, and we're lucky to have him. I hope to meet you on your next trip to Syracuse! We decided to stay for the evening as it was midpoint to our destination. When we opened the door to our room it was disgusting! The bathroom was not clean as there was urine in the toilet, garbage was full, old soap in the tub and a pile of dirty towels. The bed was not made. To top it off there appeared to be used condoms on the dresser along with the packages of shaving accessories. The hotel includes breakfast which was gross! The eggs were literally sitting in a pool of oil and the coffee machine was broken. They did end up changing our room and gave us our money back for the room due to the inconvenience. I would never stay here again! The hotel was clean, nicely decorated, comfortable beds, friendly and helpful staff. It was an ideal spot for a stopover on our trip and we found it to be very good value and situated close to restaurants and gas stations. Thank you for taking the time to review our hotel! I'm happy to hear you enjoyed your stay and I look forward to seeing you again soon! 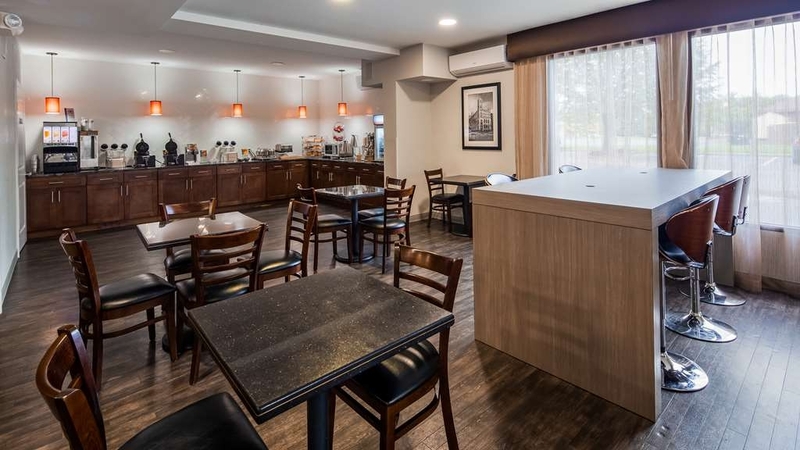 Recently renovated, this hotel was immediately adjacent to I-90. All our expectations were met. As Marriott Members, we found the breakfast in this hotel to equal or exceed those provided by Marriott. Price was fair. And, there is a very good Italian Restaurant next door (altho' a bit pricey). All our needs were met and should we need a hotel in this area again, we would not hesitate to stay here. Thank you for the fantastic review of our hotel. I'm thrilled to hear that you enjoyed your stay and that we met your expectations as Marriott Rewards members. We'd love the chance to convert your points to Best Western Reward points, match your status, and have you make the move to Best Western as your go-to brand! Thank you again, and I look forward to seeing you next time you're in Syracuse. Great location off of the I-90. Was here two years ago when hotel looked tired but their recent renovations have made a huge difference! 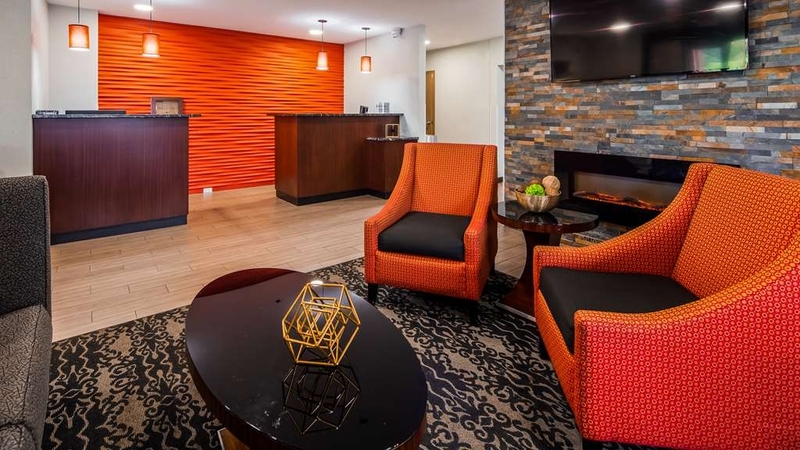 Updated lobby with fireplace, and room amenities to appeal to any seasoned traveller. Exceptional caring front desk service on both arrival and departure. More than adequate breakfast selections. Would not hesitate to recommend and will be my hotel of choice in this area for future trips. I truly appreciate you taking the time to review our hotel! I'm thrilled to hear that you enjoyed your stay with us and look forward to seeing you next time you're in town! This property is currently being remodeling, updated, and routine maintenance, so now (fall 2017), it's a little messy, but the work is done only during the day. It's not an inconvenience to guests but for the appearance. Actually, it looks like your kids had some confetti and tossed it around, but the end result will look nice. More contemporary, less dated. The property is in good repair, though, and everything we tried worked. It's a very good place to stay. Thank you for taking the time to review our hotel. I'm happy to hear that you enjoyed your stay with us and look forward to seeing you again in the future! We have used this - once as the Baymont, once as a Best Western. It is a very nice hotel. Great staff - and that is a real plus. Good breakfast. Very comfortable beds. Close to Joey's if you are looking for a good Italian Restaurant just minutes away. We will stay here again when our plans call for a night or two in Syracuse. Been using Best Western and BW Plus a lot over the last year and one half. This one fell short. Tired drab and the room was not well cleaned. I had to clean the tub/shower when I arrived and the overall cleanliness of room fell short. The rear entrance seemed very unsafe and not secure. Hotel was recently remodeled, very nice rooms, clean and decor was really nice. The king size bed was so comfortable, it was the best mattress both my husband and I have ever slept on. Staff were pleasant and lots of hot water. Hotel is centrally located and close to shopping etc. Would certainly stay at this hotel in the future. Room was clean and well supplied. Bedding was good and we were accommodated with extra pillows. Plenty of outlets including extra USB ports. Breakfast was average and area was clean with enough seating. Appears to be a fairly safe area. Internet had small glitches but not bad. The only issue was that ice machines were not working on 3 of 4 floors. We stayed here on our way from Ohio to Vermont...it was literally one of those “check-in, sleep, check-out” stays. But this was a very nice, clean hotel with friendly staff and a decent breakfast in the morning. I've been spoiled staying at Marriotts for the past few years as a family member worked there and got me awesome rates. No longer works there, so I really have to research my hotels now. I think this hotel comes close to a Marriott. Room was very clean and fresh smelling when entering it. Only flaws I saw as others have mentioned is some poor workmanship in remodeling. Poorly fitting baseboard trim and some rough caulking in the bathroom. Room was very quiet. Breakfast was decent and a good selection of items. I did find a cup of tea in the microwave that someone forgot about. There are around a dozen hotels in this area off the Carrier Circle. I've stayed at 5 of them(high end ones) and this one is just as good and for a lot less money. I got this one through Groupon so the deal was even better! Stayed at this hotel several times for business.Hotel looks new,maybe renovation was made before ,is nice and clean and has a friendly and helpful Staff.Good Restaurant next to it. Location is next to Interstate and close to airport. A lack of sound proofing or sound barriers made for a very noisy night. It sounded like a party was going on in the hallway. The breakfast selection was minimal. Tight service area made access to items difficult, and there was no milk available. I went to Syracuse to attend a concert at the Carrier Dome. This Best Western was located just off of the New York State Thruway ( I-90 ). It was close to several restaurants, and it was an easy drive to the concert. While there, we also did some sight seeing. this hotel was newly remodeled, and was very comfortable. I would stay again anytime I travel tom the Syracuse area. Thank you so much for taking the time to review our hotel! I'm thrilled to hear that you enjoyed your stay, and I look forward to seeing you again in the future! "A stop over for an Irish dancing competition "
This place offered the best bang for our buck which is why we stayed here. Hotel has been renovated and it looks great. There are some places where it appears that are not finished such as our bathroom. The tub needs some updating as does the painting on the walls. The bedroom was clean with a great bed and a new sofa couch bed. Very quiet in the room and didn't hear any outside traffic or other guests. Breakfast was your usual fair, nothing really special. The refills of items was a little slow. Entrance to the hotel was very inviting and charming. There was always free coffee, tea and hot chocolate available which was a ver nice touch. Very easy to get to off and on to the highway. I'm sorry to hear that you experienced some issues in your room, and I appreciate you bringing it to my attention so that we can correct it for the future. During our renovations, the bathrooms were completely remodeled- I will definitely look into what happened in your room that made the tub need updating again! I hope to see you again in the future. Thank you for taking the time to review our hotel. I'm thrilled to hear that you enjoyed your stay with us and I appreciate your feedback about breakfast. I hope to see you again the next time you're in the area! "Same Hotel - new name"
I stayed here when it was Baymont Inns and I would like to say it has gotten better. I do not remember the lady who checked me in but she and Thomas are excellent employees. They were always happy to see us when we arrived and helpful in answering any questions we had. Thomas was extremely helpful to me and offered a new room when I complained that the toilet was running. The inside workings need to be replaced and there was no one available to fix the issue. We found if you just let the toilet run for awhile it finally stopped. The room are very clean (thank Kristy for an excellent job and the nice note on the night stand - those things make the stay very enjoyable). The doors need to be replaced but otherwise the remodeling of the Hotel makes it very modern. Breakfast options were fine and I was glad to see that there was eggs, sausage, fruit and yogurt offered during the week( I have stayed at hotels were the breakfasts during the week was just all carbs). Besides the toilet the 2 other negatives is that the bed was high along with the counter in the bathroom. My sister is 4' 10" and had trouble climbing into the bed and reaching the faucet on the sink. Thank you so much for taking the time to review our hotel! I'm sorry to hear that you experienced an issue in your room and I appreciate you bringing it to our attention so that we can correct it for the future. I've passed your compliments on to our team as well! I hope to see you again on your next trip to Syracuse! "Great stay at BW Syracuse"
Beautiful, comfortable, great location -- very friendly staff --- they just need warm potatoes at breakfast to be perfect ! Very helpful man , Thomas, checked us in and helped us push our cart to the room -- thanks again .! Thank you for taking the time to review our hotel! We are so thrilled to hear that you enjoyed your stay and we will definitely look into your suggestion of potatoes to go along with our breakfast offerings. Thomas thanks you for the kind words as well. We hope to see you again soon! "DO NOT COME TO THIS HOTEL IF YOU NEED GOOD INTERNET OR BREAKFAST"
The internet access which appears to be controlled by a company by the name of Vista Communications Inc, is the amongst the worst I have experienced. The breakfast, pathetic is the best I can say about it. Only had coffee and it was like dish water. The bed was too soft for my liking. Did not sleep well because of the soft bed. The shower does NOT have a rubber mat. It's dangerous especially for older people. They are leaving themselves open to law suit for any one falling in shower. The water pressure of the shower is also weak and pathetic. The TV is OK. Selection of channels is good. Has a small desk for notebook which is sufficient with two power connections built in and one in the lamp on the desk. Has a decent sized fridge and could put a 1-liter bottle of water in freezer. Ice machine did not produce any ice on 3rd floor. 2nd floor ice machine broken. Only 1st floor had working ice machine. Parking is OK Would I stay here again? Definitely not! Please accept my apologies for the issues you experienced during your stay with us. We strive to exceed our guests expectations and we've clearly fallen short of that with you. All of our beds are brand new, and most of our guests rave about them- I do understand that everyone has their own preferences though and I'm sorry that you did not find them comfortable. I appreciate you bringing your concerns with the tub to my attention so that I can look at it and address it for the future. It's only with feedback from our guests that we can know where we fall short and continue to improve. "Very Clean & Modern Rooms"
Everything looked new & extremely clean! Centrally located to everything. Staff was very friendly & accommodating. The Breakfast was excellent-good choices. Comfortable beds! Housekeeping was excellent! Would recommend this Hotel for anyone staying in the area. I will definitely stay here again when in the area. I truly thank you for taking the time to review our hotel and I'm thrilled to hear that you enjoyed your stay with us. I've passed your compliments on to the housekeeping team and they appreciate the kind words- they're often overlooked when they're doing a great job and they are grateful that you noticed and acknowledged how hard they work. I look forward to seeing you again soon! "Nice place for a nice price"
We stayed here after we dropped our daughter at SUNY ESF - about a 15 minute drive away. Wonderful first impression. Thomas was very pleasant and helpful in greeting us and checking us in. The lobby and breakfast area are newly renovated and beautifully appointed. Our room was also newly done and beautiful. The king bed was a bit large for the space, but the bedding and linens were cozy and the added pullout sofa (though not needed for this visit) is an added convenience for future visits. The bathroom was a bit small but very clean, sparkly and new. I made use of empty fitness center (which includes: bike, treadmill, nordic trainer, weight machine, free weights and medicine balls). 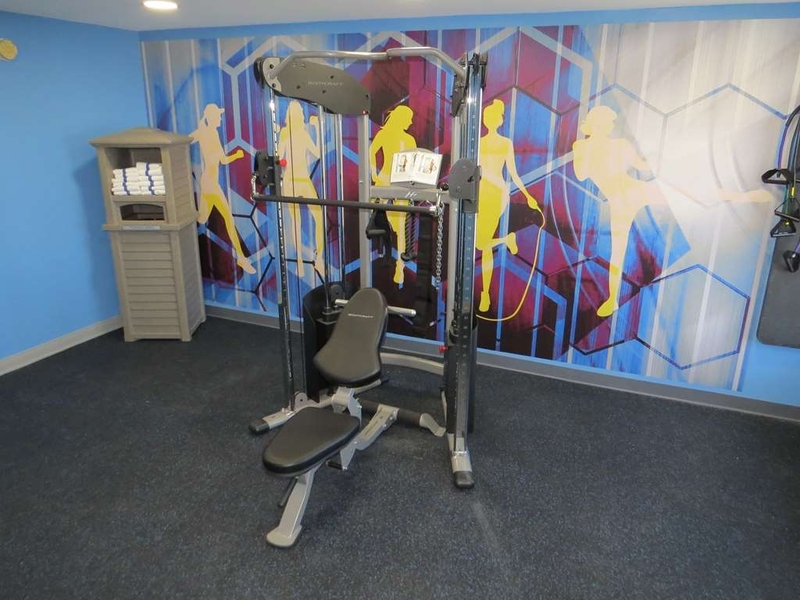 And they had something I have not seen before - Fitness Kits which can be borrowed to workout in your room. We went to breakfast on the late end of the shift. It was VERY busy. Although the food was good, much needed to be replenished and I "made do" with a few substitutions rather than wait. Lots of choices though - oatmeal, yogurt, eggs, sausage, bagels rolls and muffins, cereals and juices and of course self-serve waffles. We will definitely stay here again. Thank you for taking the time to write a review of our hotel. I'm so happy to hear that you enjoyed your stay. I've passed your compliments on to Thomas as well and he thanks you for the kind words. Unfortunately we did have some breakfast staffing issues during your stay and that led to some problems during the breakfast hours. I'm sorry that you had to settle because the items weren't well stocked. We are working on a solution should that situation arise again in the future. I hope to see you again on your next trip to Syracuse! "Nice room but not so nice breakfast"
"Needs some TLC but Nice People"
Room was nice but needed some fixing like phone didn't work and water pressure was poor. Very friendly staff and good breakfast. The motel was just renovated so I think there were problems because after a repair was done the work wasn't checked out to make sure it was done properly. Pleasant greeting, (Thomas), clean room and nice continental breakfast. Quick drive to Syracuse University. We were sent here by local Extended Stay Hotel that we booked weeks ago, but they apparently overbooked and sent us here. Would stay here again! Thank you for taking the time to review your stay with us. I'm thrilled to hear that you enjoyed your stay despite the inconvenience with Extended Stay. I've passed your compliments on to Thomas and he truly appreciates your kind words. Please keep us in mind for your next trip to Syracuse! We love Best Western Hotels... The only problem was in the morning when we went down for breakfast and the group of people who were in there, left a terrible mess and had eaten all the food. Our stay was good. Thank you for taking the time to review our hotel! I'm happy to hear that you enjoyed your stay, but apologize for the issues you experienced with breakfast. I will definitely talk to my team so that we can work harder to correct issues like this for the future. We hope to see you again next time you're in Syracuse! "Very nice hotel, friendly employees and delicious complimentary breakfast"
We just stayed at this hotel over the weekend. Upon arrival, we were greeted by a very friendly employee (Terrace W). She was very accommodating as we wanted a room close to an exit for easy access to go out to smoke. 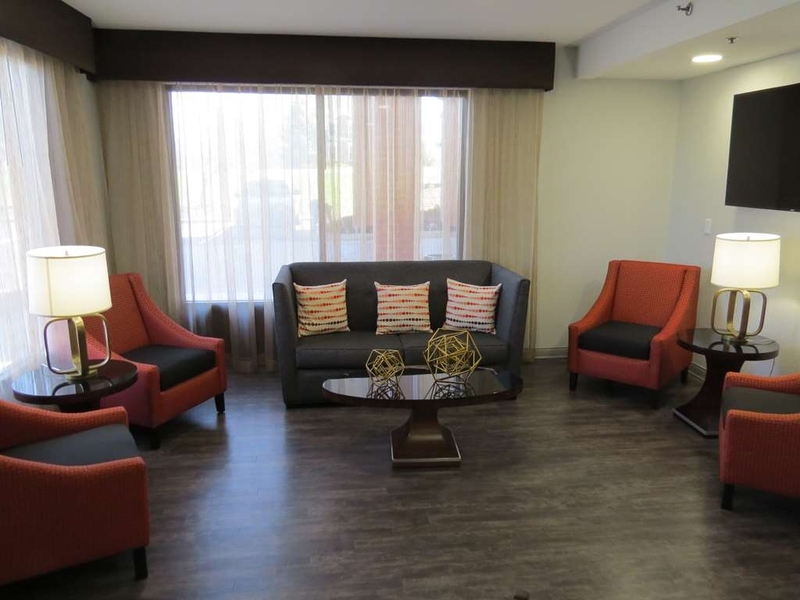 The room was very clean and looked like it had been recently renovated/updated. TV remote was clean. Special kinda of remote for hotels which is great. We had a fridge and microwave in the room as well. Terrace was always smiling and willing to go above and beyond for us and other guests. She called ahead at a restaurant for us to see what the wait time was like. The complimentary breakfast was great! A lot more food than we thought was available to us. Waffles, egg, sausage, yogurt, fresh fruit, muffins, breaks, etc... This morning's breakfast was quite busy and Terrace kept on top of refilling everything and taking care of guests at the front desk. Last night we got some wine and realized we didn't bring a bottle opener. We checked with front desk and the employee (sorry we didn't catch his name) had one for us to use and told us to bring it back when it was convienient for us. This was great as we were able to enjoy some wine in our room. The parking and hotel outdoors are kept clean as well. We definitely recommend this hotel! We will be staying here next time we are in the area. Thank you so much for taking the time to write a review of our hotel! I'm thrilled to hear that you enjoyed your stay and felt taken care of by our team. We strive to give our guests exceptional service and it seems like you experienced just that. I've passed your compliments on to Terrace and Thomas and they appreciate your kind words as well. I truly look forward to meeting you next time you're in the area! 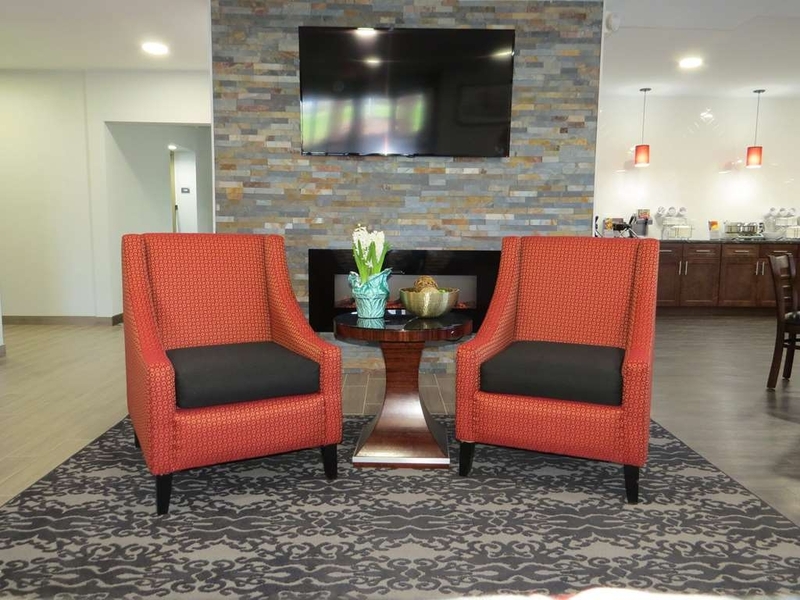 "AN ENJOYABLE STAY STARTING AT CHECK IN"
I really appreciate you taking the time to review your recent stay with us, and I'm happy to hear that you enjoyed your stay. I've passed your compliments on to Thomas, and he thanks you for your kind words. We might bring back the wheel at some point, stay tuned! "New, but needs to be fixed." The hotel has been modernized, but whoever did the job, did a slip-shod operation. I have to have more trips to this hotel, but if I can't find a room that serves my needs, I will go somewhaere else. My recommendation is check you room. If it doesn't meet you expectations, get on that does. Thank you for taking the time to review our hotel. We do offer gluten free cereal options as well as fruit and yogurt by request, and I apologize that they weren't offered to you when you made your request. I will definitely discuss that with my team and appreciate you bringing it to my attention so that I can correct it. I look forward to seeing you again soon! "Found rooms on the small side. But, staff was great." Located in the Carrier Circle area,...with plenty of other options around, we were very comfortable with this choice. The staff was exceptional, and felt very welcome upon arrival. The room was clean but, found it somewhat cramped for walking space. The breakfast food was good, but, area ( breakfast lounge ) felt a little cramped. Good place to spend one night on the road. Thanks. I really appreciate you taking the time to review our hotel, and I'm happy to hear that you enjoyed your stay and had a great experience with our team! I look forward to seeing you again on your next trip to Syracuse. "Great value and great experience"
Entire staff and housekeeping are truly dedicated to customer service. Excellent internet service and good breakfast. Varying the breakfast would have made it excellent. I would definitely stay at this location whenever I'm back in the area. Thank you for taking the time to review our hotel! I'm thrilled to hear that you enjoyed your stay with us, and look forward to seeing you again next time you're in the area. I'll definitely look into changing up our breakfast routine to keep it exciting for our guests! This was the first time back at this location since becoming a Best Western Plus. We were not disappointed. Thomas checked us in and took great care of our needs. He remembered our names during our stay. The room was nicely updated. The bed was comfy and we got a well needed sleep. The internet worked well. The room had a mini-fridge and a microwave. The TV selection was varied. We had a quick breakfast before checkout. The selection included the standard continental along with eggs and sausage. The coffee served was a nice blend. Look forward to staying here again when in the area. Thank you for taking the time to write a review of your stay with us! I'm thrilled to hear that you enjoyed your experience here and I look forward to seeing you again soon! "Awesome hotel, staff not perfect"
Please accept my apologies for the issues you experienced in breakfast during your stay with us. I appreciate you taking the time to bring your concerns to my attention so that I can correct them for the future. It's unfortunate that one employee not showing up can throw our operation so far off balance- we will be sure to come up with a back up plan should this occur in the future. Also, I will certainly discuss our breakfast policy with the housekeeping staff as they should not be in the breakfast area at all. Again I appreciate you letting me know, it's only with feedback from our guests that we can know where we fall short and continue to improve. 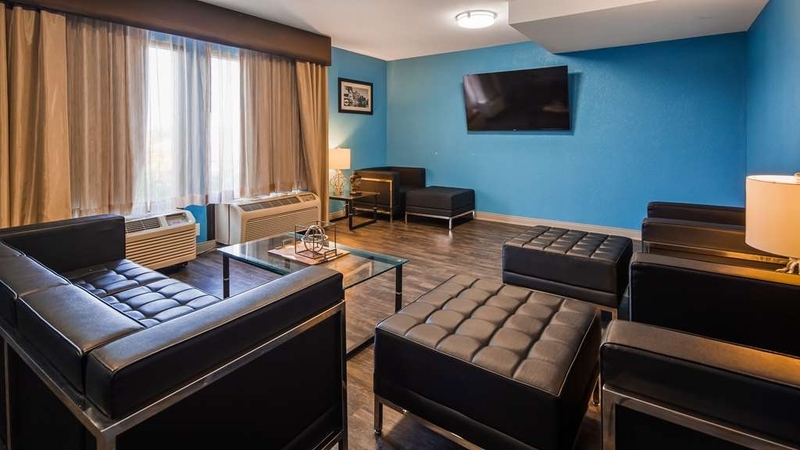 Newly renovated hotel with great service. The staff was very professional and helpful upon our arrival and later during the day. The hotel has been newly renovated. Our room was very professional looking and had all of the amenities i.e. fridge, microwave, study test to meet our needs. The bed and pillows were really comfortable. The cost of the room was more than reasonable. Breakfast offering was excellent. Staff went over and above to meet the needs of the patrons. I bookmarked this location as a 5 star for our next stay in the area. Good Job staff and BW. We are so thrilled to hear that you enjoyed your stay with us and appreciate you taking the time to let us know how we're doing! We strive to provide a clean, comfortable stay at a great value, and I'm happy that you experienced just that. I look forward to seeing you on your next trip to Syracuse. "Great rate for wedding group." The management and staff went above and beyond to help arrange guests' rooms for our daughter's recent wedding at Justin's Tuscan Grill, which is a quick and easy walk right next door. (Also, a wonderful experience at Justin's too I might add.) Andrea and Aubrey were always willing to meet with us as we had some special needs and requests from some of our wedding guests. We were able to rent a "boardroom" for the day for our daughter's hair and makeup crew to work with the bridesmaids. There is a third floor lounge where the groomsmen prepared and also a large lobby lounge (the breakfast area) to hang out too. Rooms were quiet and comfy. Terrace and Darrin were so friendly at the front desk too! Thanks BWP for a great experience! Thank you, Stephen, for such a great review. It truly was our pleasure to have all of your stay with us!! We're thrilled to hear that you enjoyed everything and the wedding went off without a hitch. If there's ever anything that we can do for you or your family in the future, please don't hesitate to reach out! Our stay was overall excellent. The room was spotless, attractive and comfortable. The staff were excellent, and went out of their way to make the stay pleasant, and to help with special arrangements (early check-in to accommodate my elderly mother). Every staff member we encountered was pleasant and helpful. The breakfast service was excellent, and much better than other places I have stayed with similar services. I really appreciate you taking the time to write a review of your recent stay with us, and I'm happy to hear that you enjoyed yourselves. It was our pleasure to serve you and we look forward to seeing you again in the future! A great place to stay if your in the Syracuse Area. The staff was extremely helpful. Overall I would say they were fantastic. Thomas and Alexis (Spelling??) were great. I was overjoyed at the treatment I received here. Wow! I'm so excited to hear that you enjoyed your stay with us, thank you for sharing your feedback! I've passed your compliments on to Thomas and Alexis and they appreciate your kind words as well. We all look forward to seeing you next time! Nice, comfortable room. Convenient location. Great breakfast. Room was very clean and updated. We were on our way to the Thousand Islands and this was a great stopping point. Several restaurants are located in the area, which was very convenient. Thank you so much for taking the time to write a review of your experience at our hotel. We really value your feedback and are thrilled to hear that you enjoyed your stay. We look forward to seeing you on your next trip to (or through) Syracuse!! "Great service - great price"
The hotel has recently been "done over". Rooms are very clean, good sized, and pretty well decorated. The outside is nothing to look at, and the lobby is no more than adequate. The service was exceptional - the folks behind the desk went out of their way to show us a room (before deciding to stay) and to make sure our stay went smoothly. Also the hotel is well located - close (walking distance) to several decent restaurants. Finally the breakfast was good and the price of the room was less than expected. An very good deal. I really appreciate you taking the time to write a review of your stay with us. We're excited to get the outside looking as good as the inside in the near future- the painters are here now, and landscaping will be next! I'm so happy to hear that you enjoyed your stay and I look forward to seeing you again in the future. I was so amazed after driving so tired coming back from Toronto and walking in to book a room with my wife and Thomas the customer service rep that was on duty that night was so amazing and respectful to us and curiosity. As a Regional manager for a big corporate company I will hire him in a heart beat! Wow! Thank you so much for taking the time to write a review. I'm so thrilled to hear that you enjoyed your stay with us. I've passed your compliments on to Thomas and he truly appreciates your kind words as well. He's a great member of our team, and we're lucky to have him. I look forward to seeing you again on your next trip to Syracuse! 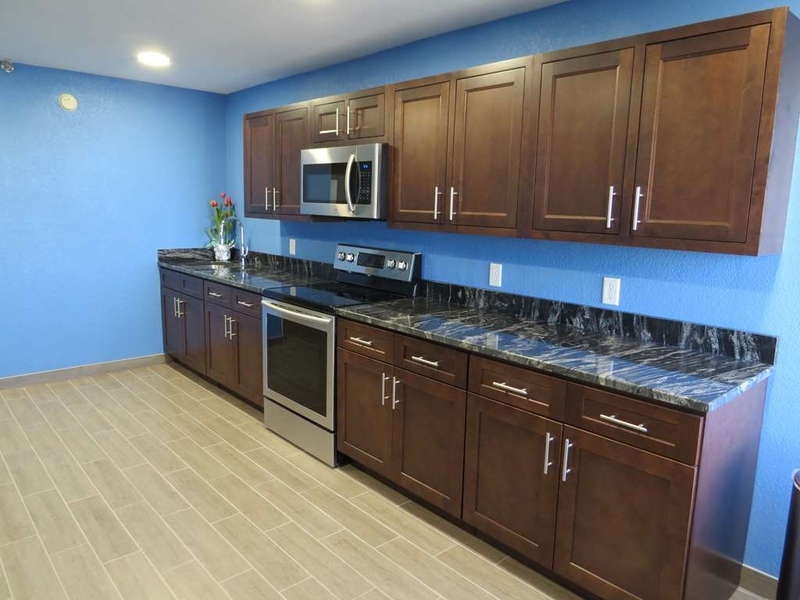 Outstanding property with spotless, freshly remodeled rooms and excellent staff. Groupon special brought us in but would choose to stay at this property again if we return to the area. Highly recommend! We can't wait to have you as our guest again! Thank you for taking the time to let us know how we're doing- it really means a lot to us. "3 days of great rest"
Cerrace was incredibly professional She greeted all the guests and she remembered many of their names including mine. I was impressed with all the personnel that I came in contact with. On our last day. My wife had to leave very early and I asked the night manager for milk for our coffee without hesitation he produced the milk. The staff at this BW is 5 Stars. Wow!! Thank you so much for taking the time to write such a great review! I've passed your compliments onto my team, and they truly appreciate your kind words as well. We work hard to give our guests the BEST service around, and I'm thrilled to hear that our hard work is paying off. I look forward to seeing you again next time you're in Syracuse! I have stayed at this location probably half a dozen times over the years. This was the first time as a Best Western Plus. The location was safe and clean and the breakfast bar and seating were fine. My shower could have used some adjustments to let the user know that the shower will go on with out the opportunity to set the temperature. I would be happy to use this location again! "New Name and still a nice place!" I have stayed at this location several times over the years, but this was the first time as a Best Western. The location was safe and clean and I anticipate staying here again. My only problem was with the shower. I did not know that the shower would come on right away without the opportunity to set the temperature. Thank you so much for taking the time to write a review of our hotel. I appreciate you bringing the concerns you have about the shower to my attention. I'm happy to hear that you enjoyed your stay otherwise, and look forward to seeing you again soon! Very near to all the facilities and quick on/off from the highway. the staff is good as well and help with directions (due to couple of detours). The hotel although looks old, is upgraded, The staff is helpful as well. Stayed overnight with Family. Excellent and very professional staff. Clean rooms, comfortable beds, good internet and TV, clean and sparkling bathroom with good quality amenities, excellent check-out. Strongly recommend to all to come to Best Western! I really appreciate you taking the time to review our hotel. We work hard to give our guests an exceptional experience at a great value, and I'm happy to hear that you experienced just that! I look forward to seeing you again next time you're in the area! Our experience was incredible, as soon as we walked in we were greeted with open arms and a great smile! The staff was exceptional! The room was beautiful! The breakfast was delicious! The location is great! Would definitely recommend this hotel for anybody, the staff made us feel very welcomed and went above and beyond! The hotel and the rooms were also very clean! Definitely exceeded any expectations we had! STAY AT THIS HOTEL!!! WOW!! Thank you so much for taking the time to let us know you had such an awesome stay!!! It's our goal to exceed the expectations of every guest who enters our hotel, and I'm thrilled to hear that we crushed that goal with you. I've passed your compliments on to the team, and they really appreciate your kind words. I look forward to meeting you on your next trip to Syracuse! In town for a softball tournament with 10 families. Thomas greeted us and was there for us our entire stay. He did an awesome job including opening the breakfast early both days so we could get to our games. He always had a smile in spite of clearly being overworked, Rooms were small but clean. We'd come back. We were so happy to host your team, and I'm thrilled to hear that you enjoyed your stay with us. I've passed your compliments on to Thomas and he appreciates your kind words. He is definitely an asset to our team, and we're lucky to have him! Thank you for taking the time to send us your thoughts. We look forward to seeing you again in the future! Very nice newly renovated hotel. The staff are very helpful and friendly. The rooms were nice and the beds very comfortable. We were in town with a large group of children and their parents. The experience was terrific right from the very first phone call. Thank you so much for taking the time to review our hotel! I'm thrilled to hear that you enjoyed your stay with us, and I look forward to seeing you again the next time you're in Syracuse! 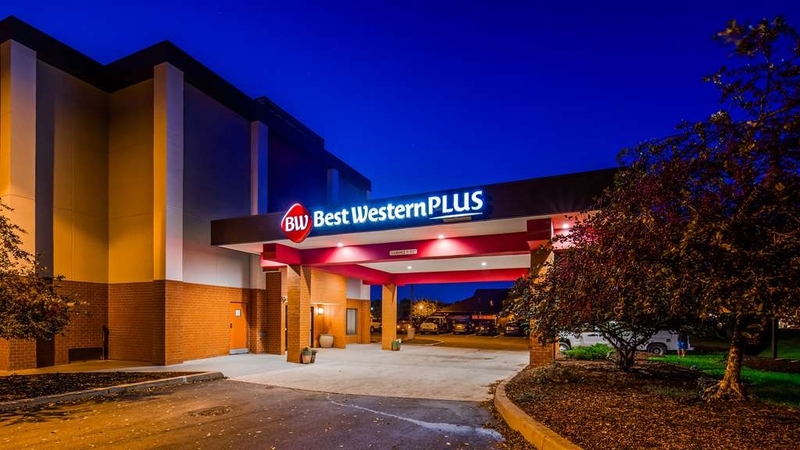 This is now the best western plus and just opened in April 2017 after a huge multi million dollar renovation. It is so modern and clean. Beds comfy and all furniture is brand new. Staff was so nice and friendly. Thanks for a great stay. We are so happy to hear that you enjoyed your stay with us, and we truly appreciate you taking the time to review our hotel! We hope to see you again on your next trip to Syracuse! From the time we arrived until the time we departed the staff of this hotel was wonderful. They greeted us at the door with smiles each time we entered and were very accommodating. We were there for graduation at Syracuse and had a total of five rooms. They provided great goody bags for each room. Upon arriving back at the hotel after the Friday night festivities I noticed a very strong smell in my room and called the front desk. The clerk immediately offered me a new room and met me in the hallway with the new key. It was obvious this hotel has recently had some updates, which was nice. My only issues with this hotel are that the walls are thin so you can hear the television in the next room. Also, the air conditioner was very loud and the doors to the hallway were thin. Noise from people, who checked in after midnight, woke me up. They were spread out over 3 rooms and were talking from the doorways of their 3 rooms at full volume. I never understand why people aren't considerate when they are in the hallway, but that, of course, is not the hotel's fault. Thank you so much for taking the time to review our hotel! I'm so happy to hear that you enjoyed your stay with us and I apologize that you had some issues with noise in the halls. I've passed your compliments on to the team, and they thank you for your kind words as well!! Congrats again on your graduate and we hope to see you again next time you're in town! I am so impressed by the friendly and accommodating staff - they wenr out oftheir way to make our stay such a wonderful experience! The rooms were very nice and super comfortable beds. I would recommend this hotel to anybody - thank you!!! Thank you for taking the time to write such a great review, I really appreciate your feedback. I'm so thrilled to hear that you enjoyed your stay with us. We strive to exceed the expectations of all of our guests with clean, comfortable accommodations and exceptional service - so I'm happy to hear that you received just that. I look forward to seeing you again on your next trip to Syracuse. "Ok for a few days"
Was here for my son's graduation. Hotel was 15 minutes from the venue. Staff were pleasantly helpful. Room was clean. Comfortable has parking and breakfast. But toilet didn't flush. Wake up call never came!! Thank you so much for taking the time to review our hotel. I'm so sorry to hear that you had issues in your room, but I appreciate you bringing it to my attention so that I can correct it for the future. I hope that you'll give us another chance to WOW you next time you're in Syracuse. "stayed for the Syracuse University graduation"
We stayed for the Syracuse University graduation, super friendly staff. Every employee we past said hello!! amazing welcome bag given and reception in lobby. We were also able to enjoy the outside gas fireplace. I really appreciate you taking the time to let me know about your stay with us! I'm thrilled to hear that you enjoyed yourself, we really love welcoming all of the Syracuse University families on Graduation Weekend. There's always such excitement in the air!! I've passed your compliments on to the team and they truly appreciate your kind words. If you're ever back in the area, we'd love to see you!! We were fortunate to come to this 2 week old Best Western Plus Property. 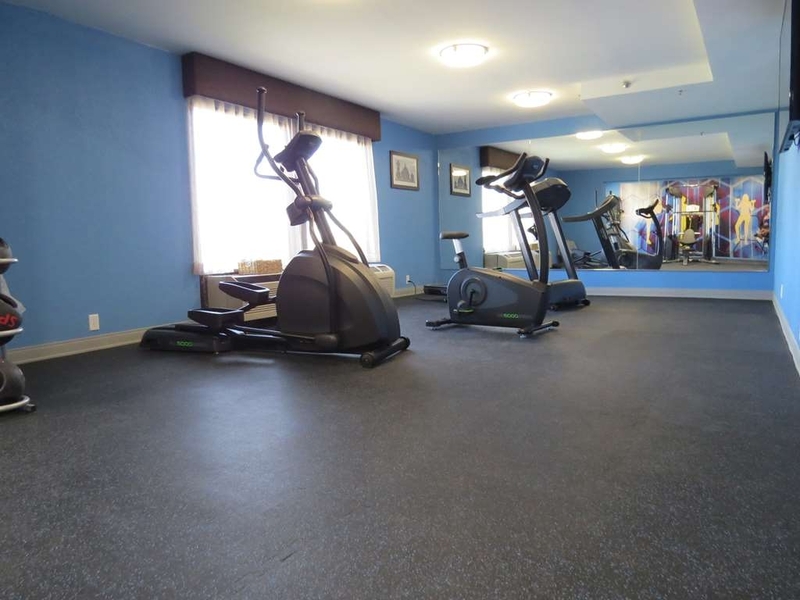 It was fantastically clean and the staff was very accommodating. it really was clean and comfortable but we did learn a couple of things I thought I would share. If you see a bus, or 2, in the parking lot, either eat breakfast at 6-7 or eat elsewhere. Just not enough space to eat for even one bus load. We were not able to get a handicap accessible room for my mother when we arrived so we selected a room with two double beds. Now most everyone likes the way the height of the beds have been going up and up over the years, but they have gone too far. The top of these beds were nearly 30" off the ground. The only way my 82 year old mother could get in and out of bed was to go get a chair from the conference room. No stools available from front desk. So if you have any older people say 5'3" in your group you may want to go somewhere else. Thank you for taking the time to review our hotel! I'm happy to hear that you found the staff accommodating and the hotel clean, and I apologize for the inconveniences you encountered. 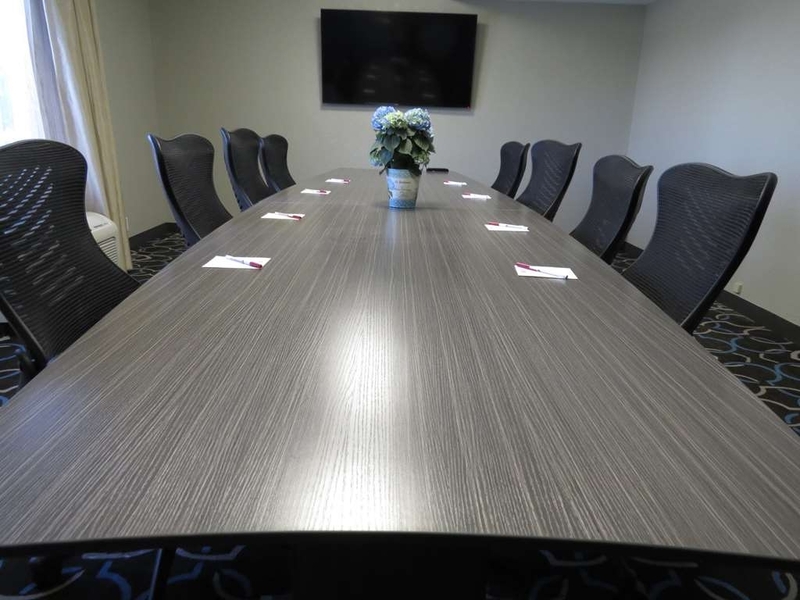 We do offer additional breakfast seating in our meeting room on mornings when we know the breakfast area will get too crowded, I apologize if that wasn't communicated to you- I'll be sure to discuss it with my team. Regarding the beds, as you mentioned, some people love them and others struggle with them. We do now have stools available at the front desk if you or someone in your party fall in the latter. Thank you again for the review and for choosing us. I hope to see you again next time you're in Syracuse. Stayed 2 nights picking up my daughter from college and visiting old friends (we moved to the mid-west recently). Had the best nights sleep in ages!! The bed was comfy, room was clean and fresh smelling. We loved it!! I'm so thrilled to hear that you had a great night's sleep and enjoyed your stay with us! Thank you for taking the time to let us know about your experience. I look forward to seeing you again when you bring your student back in the fall! "Brand new room and great price"
This hotel is in the process of being remodeled and converted to a Best Western Plus. We had a lovely brand new modern room on the fourth floor on the southside with a very soothing and pleasant decor. For $62 for the night we had a king size bed and a nice firm couch to sit on. The bed was firm and the pillows very fluffy. The rooms had a refrigerator, microwave, and coffee maker. There were plenty of lights and great lights for reading in bed. For some you might find the room a tad small, but we were very happy with the space. The wifi was speedy, but there were not a lot of people staying here. The continental breakfast was basic and filled the bill. Tom the late afternoon desk clerk was friendly and efficient. Thank you so much for taking the time to review our hotel!! I am thrilled to hear that you enjoyed your stay with us. Thomas thanks you for your kind words as well. I look forward to seeing you again next time you're in Syracuse! "Best deal when staying in Syracuse "
Stay here all the time whenever I am in town for business. The staff always goes out there way to make sure that any request is always taken care of. I feel like I'm at home. Recently upgraded the entire hotel and the accommodations are very welcoming!!!! We really appreciate you taking the time to review our hotel. We love having you, and we're so happy to hear that we make you feel like you're at home!! See you soon! "My New Place to Stay when in Syracuse"
My new place to stay when in the East Syracuse area. This hotel is newly refurbished inside and out. Clean rooms and grounds and a friendly helpful staff. Great rates are and the free hot breakfast make it a good choice. Thank you for taking the time to review our hotel! I'm so happy to hear that you enjoyed everything, and I look forward to seeing you again in the future! This hotel was just delightful. Clean, beautiful decor and oh so comfortable. The beds were amazing and rooms well appointed and comfortable and the staff was just friendly. Highly recommend this hotel!! Wow!! We strive to be the best Best Western ever, so I'm thrilled to hear that we're getting there and our guests are experiencing it! Thank you for taking the time to let us know how we're doing- it's very much appreciated by myself and my whole team. I truly look forward to seeing you again next time you're in Syracuse. "All it takes is a smile"
"Deffinately under Construction but very good Otherwise"
This place is soon going to be a very decent hotel. In the meantime they have been offering really good deals to stay since its under construction. They will put you in the completed rooms and they are very nice. Our family stayed there 2 nights and had no issues at all. We really appreciate you taking the time to review our hotel and we're so happy to hear that you enjoyed your stay despite the construction!! Renovations are always tough and we're doing our best to make sure it doesn't impact our guests negatively. Thank you again for the kind words during this challenging time, we look forward to seeing you again soon! "Under construction...but definitely open for business!" Booked here only on the merits of TripAdvisor reviews, and we were not disappointed. We already knew that they were in the midst of construction - and this was not understated. The whole lobby was in a state of non-existence, but the front desk staff were still working from a portable desk set-up, and were both friendly and hospitable. Check in was a breeze, and we were in our room in no time. At this time, the entire first floor is under construction, but our 3rd floor room was freshly renovated and very well appointed. There were only a couple small things that still gave away the age of the hotel after the renovation - the bathroom door and black-out drapes had not been replaced, but these were just small details and didn't affect our stay at all. Our room had a beautiful, comfortable king size bed, a large screen television, fridge, microwave, coffeemaker, closet, ironing board/iron, etc. - everything you could possibly need for a restful night. And, most importantly, it was very quiet. Granted, there weren't a lot of other guests in the hotel on the night that we stayed, but I would venture a guess that it wouldn't affect the noise level very much at all. The free continental breakfast was just that - continental. There was no fresh fruit, yogurt, juice, or other niceties - just cereal, breads, pastries, coffee or tea. But, for the price of the room, this is a fantastic value and I would not hesitate to stay here again. When the construction inconveniences are through, a higher rating is sure to follow! Thank you so much for such a great, detailed review!! We truly appreciate you taking the time to describe your experience with us. This renovation has been tough on our team and our guests, but I'm so thrilled to hear that even though you saw our dust it didn't affect your stay. We've worked very hard to give a great guest experience throughout this difficult process. I've passed your compliments onto the team and they thank you for your kind words. We can't wait to get these final finishing touches completed and have you back as our guest. I look forward to seeing you again soon! we checked in late at night after a 5 hr drive and was very pleased to be welcomed by a friendly Receptionist, who checked us in quickly. We got one of the newly renovated rooms with a king size bed and a couch. The room felt roomy and was fresh and clean. Part of the Lobby is under construction but there's plenty of room to move around and the area being renovated is covered in well. Breakfast was ok, all I really wanted was a banana and yogurt but they didnt have any so I ended up getting bagels,tea and oatmeal. I really appreciate you taking the time to review our hotel and I'm so pleased to hear that you enjoyed your stay. We try our very best to keep our renovation dust under wraps so that it doesn't affect our guests in any way. Please accept my apology for the lack of breakfast items- I will definitely look into that. I look forward to seeing you again the next time you're in Syracuse! Stayed here two nights after booking through Hotwire. It's located among all the other hotels and motels near Carrier Circle, so it's a safe area but not the most lively. I got one of the renovated rooms, which was clean, quiet, and comfortable. Although they're still renovating, this didn't cause any issues. Front desk attendant was very friendly and helpful. Thank you so much for taking the time to review our hotel. I'm so happy to hear that you enjoyed your stay with us despite the renovation going on while you were here! I've passed your compliments on to my front desk team, and they appreciate your kind words. I look forward to seeing you again on your next trip to Syracuse. Stayed during Black Friday weekend... Great value ....Hotel is going through a major renovation . Our room was on the 4 the floor.. Newly painted ..new carpet, beds, furniture and linens.. Was very clean.. The staff efficient and friendly...especially Terrace who was most helpful with an issue.. The hotel is within walking distance to a couple of good restaurants. Would stay again. Thank you for taking the time to review our hotel! I'm so happy to hear that you enjoyed your stay on our newly renovated floor. I've passed your compliments on to Terrace and the whole team, and they really appreciate your kind words. We work hard to provide our guests with exceptional service and I'm so pleased to hear that you experienced just that. I look forward to seeing you again on your next trip to Syracuse!